This image shows the self-folding process of smart shape-memory materials with slightly different responses to heat. Image: Qi Laboratory, Georgia Tech. Using components made from smart shape-memory materials with slightly different responses to heat, researchers have demonstrated a four-dimensional printing technology that allows the creation of complex self-folding structures. 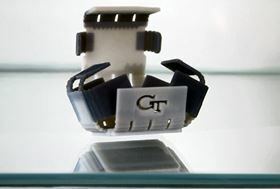 The technology, developed by researchers at the Georgia Institute of Technology and the Singapore University of Technology and Design (SUTD), could be used to create three-dimensional (3D) structures that sequentially fold themselves from components that have been flat or rolled into a tube for shipment. The components could respond to stimuli such as temperature, moisture or light in a way that is precisely timed to create objects such as space structures, deployable medical devices, robots and toys. The researchers used smart shape memory polymers (SMPs) that possess the ability to remember one shape but change to another programmed shape when uniform heat is applied. To create objects that change shape in a controlled sequence over time, the researchers used a 3D printer to print multiple SMPs with different dynamic mechanical properties in prescribed patterns throughout the 3D object. When these components are then heated, each SMP responds at a different rate to change its shape, depending on its own internal clock. By carefully timing these changes, 3D objects can be programmed to self-assemble. The work was funded by the US Air Force Office of Scientific Research, the US National Science Foundation and the Singapore National Research Foundation through the SUTD DManD Centre, and is published in Scientific Reports. "Previous efforts to create sequential shape changing components involved placing multiple heaters at specific regions in a component and then controlling the on-and-off time of individual heaters," explained Jerry Qi, a professor in the School of Mechanical Engineering at Georgia Tech. "This earlier approach essentially requires controlling the heat applied throughout the component in both space and time and is complicated. We turned this approach around and used a spatially uniform temperature which is easier to apply and then exploited the ability of different materials to internally control their rate of shape change through their molecular design." The team demonstrated the approach with a series of examples, including an object that can be switched from a flat strip to a locked configuration as one end controllably bends and threads itself through a keyhole. They also demonstrated a flat sheet that can fold itself into a 3D box with interlocking flaps. These examples all require precise control over the folding sequence of different parts of the structure to avoid collisions between the components during folding. "We have exploited the ability to 3D print smart polymers and integrate as many as ten different materials precisely into a 3D structure," said Martin Dunn, a professor at Singapore University of Technology and Design who is also the director of the SUTD Digital Manufacturing and Design Centre. "We are now extending this concept of digital SMPs to enable printing of SMPs with dynamic mechanical properties that vary continuously in 3D space." The team used companion finite element simulations to predict the responses of the 3D printed components, which were made by varying the ratios of two different commercially-available shape-memory polymers. A simplified reduced-order model was also developed to rapidly and accurately describe the physics of the self-folding process. "An important aspect of self-folding is the management of self-collisions, where different portions of the folding structure contact and then block further folding," the researchers said in their paper. "A metric is developed to predict collisions and is used together with the reduced-order model to design self-folding structures that lock themselves into stable desired configurations." The research team envisions a broad range of applications for their technology. For example, an unmanned air vehicle might change shape from one designed for a cruise mission to one designed for a dive. Also possible would be 3D components designed to fold flat or be rolled up into tubes so they could be easily transported, and then later deformed into their intended 3D configuration for use.